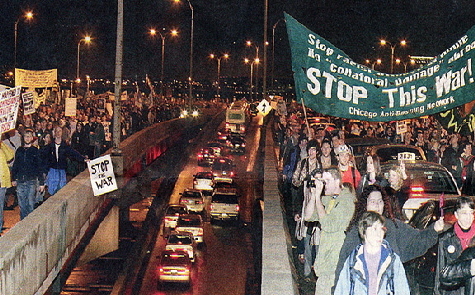 On March 20th, 2003, shortly after more than 18,000 antiwar protesters marched against the escalation of the war in Iraq, in so doing overtaking control of the six-lane highway of Lake Shore Drive, in one of the landmark protests in Chicago history. The protest garnered international attention at the time. Some believe that the coverage embarrassed the local administration, who then ordered police to block the march, doing so at the intersection of Michigan and Oak and arresting its participants. The result was the largest mass-arrest in Chicago history (about 860 arrested), with more arrests in one evening than in a week of the vaunted 1968 Democratic National Convention protests. In subsequent years, activists commemorated the 2003 protest by trying to resume the march down Michigan Avenue, but again facing resistance by the administration. In 2006, activists finally won the right to do so after three years of struggle, but they continued to face resistance by the city. Activists also saw foot-dragging in the courts when activists sued the city over the suppression of the rights of free speech and freedom of assembly; a multimillion-dollar settlement was reached nearly nine years after the Lake Shore Drive takeover (the lawsuit over the war protest was longer than the war that was protested against). For the 10th anniversary, Chicagoans have marched again in downtown Chicago and held a forum on the Iraq war and its aftermath.